Even after having lived in the UAE for almost 16 years, there are still new spots to be discovered. Such was the case when I lately saw some images appear on social media of an abandoned village in the Emirate of Sharjah; close to Al Madam. 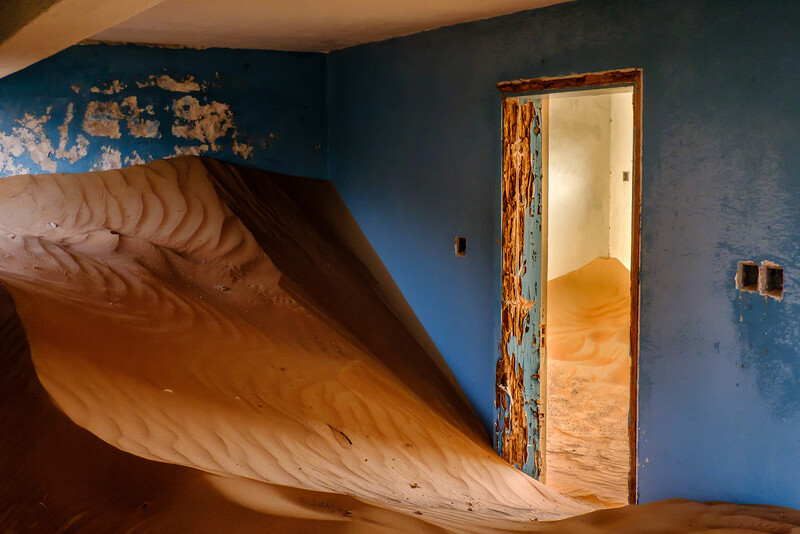 The place reminded me a lot about Kolmanskop (Namibia), where the desert had taken over entire houses; providing great scenery for some dramatic images. On the edge of the village Al Madam in the UAE, one finds a deserted compound, bordering the desert. Not entirely sure how long the place has been abandoned, some of the houses have the sand dunes piled up to the roof. While testing the new Fujifilm X-H1, I shot a series of images of Nature taking over mankind. In the image below I was particularly attracted by the blue walls which stand in contrast to the warm yellow sand. The completely worn out door frame, which clearly has suffered a lot from the elements, adds a nice touch. Even after all those years, I'm still intrigued how quickly a desert is changing with the prevailing winds; something that clearly be experienced in places like the above. A few years ago, I documented another abandoned village in the UAE, which I called, "The village that always sleeps". Click here for a link to the respective blogpost. If you missed it, my Fujifilm X-H1 review can be found here.